The full name of this fragrance is The Fox-Woman Kuzunoha Leaving Her Child. Due to space constraints, I couldn’t fit that whole thing in the title above. Regardless, Kuzunoha is a beautifully done clean tea floral fragrance from Black Phoenix Alchemy Lab. In Bottle: Lovely wafty of soft white tea settled with a pleasant bit of woodsiness. The jasmine in this fragrance lends the scent an even more tea-like personality. Applied: Kuzunoha is one of my favorite fragrances. It’s light and beautiful and airy. The opening is a straight up showing of what the fragrance has, settling first with a hit of white tea followed by gently powdered jasmine. The white tea and jasmine mix well to make this fragrance smell a bit more like jasmine tea than just white tea while the two florals in this scent mix to make a floating floral background. The wisteria and cherry blossom are very light. The cherry blossom making a bigger appearance but it is still largely relegated to the background. The real star of the show here is definitely jasmine. Finally, the teak adds a tiny bit of woodsy presence to the fragrance to round it out. The entire experience is elegant, well-done, and very beautiful. Kuzunoha also benefits from the light approach because it is a very easy fragrance to wear. Extra: The Fox-Woman Kuzunoha Leaving Her Child is a print by artist, Yoshitoshi Tsukioka. Design: The Fox-Woman Kuzunoha Leaving Her Child is bottled in a similar way to most Black Phoenix Alchemy lab perfume oils. The glass is an amber color with a square label affixed to the surface of the glass. The label in this case features artwork by Yoshitoshi Tsukioka whose painting of the same name inspired this fragrance. Notes: White tea, cherry blossom, wisteria, star jasmine, teak. Big as I am on this fragrance, its longevity leaves a bit to be desired. I’m not surprised by this as most of the notes are rather fleeting in and of themselves. 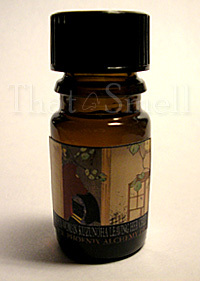 Reviewed in This Post: The Fox-Woman Kuzunoha Leaving Her Child, 2010, 5ml Bottle. This entry was posted in black phoenix, floral, Reviews By House and tagged cherry blossom, star jasmine, teak, white tea, wisteria. Bookmark the permalink.